Experience and explore the inshore flats fishing in gorgeous Biscayne Bay in downtown Miami! Just minutes from downtown Miami, FL. View its beautiful blue water, while experiencing the thrill of a chance to catch sea trout, snapper, snook, mackerel, grouper, jack crevalle and all while viewing Miami Heat arena. Many fishing enthusiast want a good meal to take home and this is a great location for dinner one of the best fishing areas. All charters are guided by a licensed Captain in a modern boat, provides the fishing rods and reels and all the tackle and safety equipment. This charter is a unique location for many anglers and a opportunity for pictures you won't want to leave without taking. Booking with confidence on TripAdvisor, it makes this charter an easy, reliable and enjoyable decision. Reserve Today to get hooked up! On this Miami bay fishing charter the Captain provides fishing instructions and casting lessons which are all included for beginners and advanced techniques for the experts. Charters are suited for both first-timers, experienced anglers, elderly, youth, families and children of all ages and are handicap friendly. So everyone is sure to have a blast as you fish with ease and comfort of the calm backwater never needlessly worrying about being seasick. Start by meeting the captain at the meeting location on your itinerary, no worries, no concerns, nothing to forget just step on board and start enjoying the day. Fish and sit comfortably in our 22’ bay boats designed for this type of fishing. All boats accommodate a max of four anglers plus the captain and are equipped with GPS, VHF radio, live-bait tank, and livewells to keep your catch. Off you go, enjoying the feeling of being in Miami, never losing sight of the shoreline. Looking to escape the fast paste of the big city, a 10 minute boat ride finds you in Biscayne Bay where you enjoy the great fishing all while viewing and cruising by multi-million dollar homes. While out on the water, the boat will have a cooler on board with ice and bottled water to keep you hydrated. There's plenty of space to bring lunch sandwiches or your additional favorite beverage. Alcohol beverages in cans or plastic bottles are permitted. Never concern yourselves of the worry of restrooms, as there are a few along our path and we can make a pit stop at anytime. Whatever your target species, our Captain is confident he will be able to put you on the fish you’re after, of course depending on the season and weather conditions. The area provides Snook, Trout, Tarpon, Sharks, Flounder, Bluefish and all the other species that inhabit the beautiful waters of the Miami Bay. 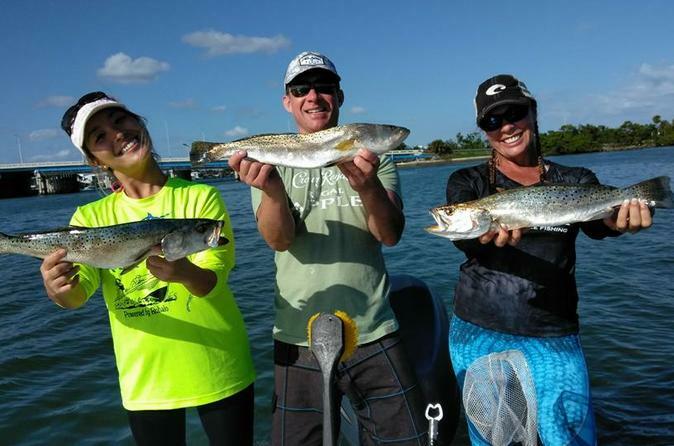 You will be fishing the shallow coves, rivers, canals, bays, inlets, bridges and grass flats along the edge of the Miami Bay using a variety of live bait and artificial lures. Once the catching starts, your captain will know which fish are legal to keep and all the local laws of how many each person can harvest. If you prefer to release then, that's okay too. Once the trip expires, you head back to the original dock where your captain will clean and prepare your catch for you to take with you. Prepare this does take a bit of time if a lot of fish are caught, which cannot be done on the water. This is a local Miami Bay charter you surely do not want to miss out on while in the area...reserve it today!